When I was seventeen a friend of mine asked me if I wanted to babysit a friend’s son over the weekend in a village in the mountains near Madrid. Her friend was a divorced father and his son was five or six years old. I said yes and prepared my suitcase for the trip. In the suitcase I put my Pink-Panther leggings – very fashionable in the Eighties – and the book I was reading, Brideshead Revisited. I loved that book; it was a Spanish translation but I think it was a very good one. I was completely in love with the British setting and the educated and funny characters that appeared in the book. In short, I dreamed about that world of humour, culture and history. The weekend was fine, the boy behaved well and I was happy because I had some time to read my wonderful book. The man – I can’t remember his name – told me he was going to take me home but first he had to pick something up from his flat in Madrid. So we stopped in his street and I had an intuition that I shouldn’t leave my bag in the boot. I told the man this but he said, “Don’t worry, it’s safe.” I didn’t want to insist and I supposed he knew best. We went to his flat and when we came back to the car he saw something he didn’t like. We approached the car and my heart started beating hard. The boot was slightly opened and inside there was nothing. My suitcase had gone. I was very upset because I knew it hadn’t been a good idea to leave it there. My beautiful Pink-Panther leggings and my Brideshead Revisited were lost forever! I was young and couldn’t at that time buy the book again and I think I had just four chapters left to finish it. I was very sad. He was very sorry but couldn’t do anything for me to recover my stuff. Years later the BBC made the TV series of Brideshead Revisited with Jeremy Irons as the main character and I enjoyed it a lot. I met my husband Nick in Madrid. When we were living together we watched and recorded the repeats of the series dubbed into Spanish. Nick was born in Oxford but when I met him his parents were living in London. 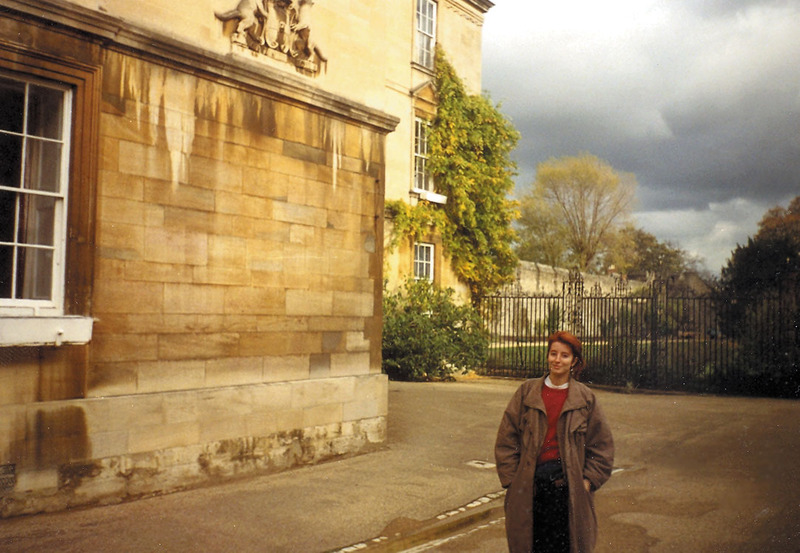 I can’t remember if it was one day during the weekend in Oxford or later when his parents left London to go back to their house in Oxford that we were visiting the town and suddenly I remembered Brideshead Revisited and I realized I was fulfilling a dream. I was surrounded by these beautiful houses and green lawns, these educated witty people and I was the main character of this romance written in my mind when I was seventeen.